Virginia & Truckee Coach-Caboose No. 8 was built in 1869 for $3822 by the V&T shops, then located in Virginia City. Originally it was Virginia City & Truckee Railroad (the name at that time) No. 1. It was designed for caboose service, which in those days included carrying third class passengers, and brought up the rear of the first train between Carson City and Virginia City in January 1870. After the V&T's Reno extension was completed in 1872 and the railroad purchased new cars Nos. 1-4 for the first class passenger train, the old caboose was taken into the shops for refurbishing, and returned to its old service in 1873 as No. 8. As years went by, No. 8 saw less and less service. In 1915 it was converted to a combination sleeper, work room and diner for the the Interstate Commerce Commission valuation crew. In March/April of 1923, the side doors were removed, and the car was converted to V&T MW construction cook and dining car, still as No. 8. In October 1945 it was resurrected as a club car, and given the name Julia Bullette (misspelled for Julia Bulette of Virginia City) for a Lions Club excursion. The car was sold to Metro-Goldwin-Mayer in August 1947 for $1,550. 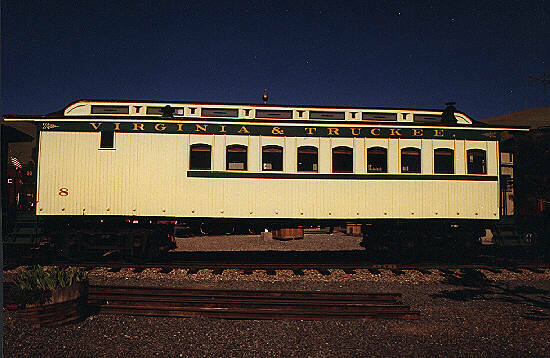 On May 16 1970, it was auctioned to Ronald G. Steiner for $3,250, and it was restored as V&T passenger caboose No. 8. Transferred April 10, 1973 to Short Line Enterprises and restored for continued movie service, the Nevada State Railroad Museum acquired it in 1988. It is now operated for special events by the Museum, and is awaiting its turn for a full historical restoration.